Cars and USB technology are now inseparable. Newer car models now come out sporting built-in USB ports in an attempt to appeal to the new technology savvy crowd. Still, it’s important to acknowledge that not all car models are equipped with built-in USB ports. For these cars, the custom USB chargers at PremiumUSB offer a perfect alternative for charging your mobile devices within the confines of your car. PremiumUSB custom USB car chargers are made up to the same ideals behind quality as other branded products are. The main difference between ordering from PremiumUSB and ordering from a branded name would a difference determined by the branded name’s popularity. PremiumUSB custom USB car chargers work just as ably as branded chargers. 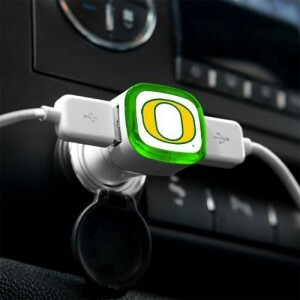 They plug into a car’s power jack and draw from this power source to charge your device. Because of its two-port design, PremiumUSB’s car chargers can in actuality charge two mobile devices at the same time. 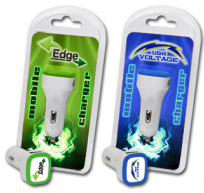 The custom USB car chargers have a total charging current capacity of 2100mA, enough for a few full charges of one smartphone throughout the day. The charger itself is compatible with a majority of USB cables, so charging compatibility across platforms should pose no problems for the PremiumUSB products. In the name of durability and again quality, these custom car chargers are manufactured using high impact ABS plastic. High impact ABS plastic guarantees that the car chargers in question can go through more than their fair share of daily wear and still perform up to standard. A bonus tidbit about the manufacturing is that all of PremiumUSB’s assembly takes place in the U.S. and uses quality parts and components in the production process. In order to be properly called custom USB car chargers, the chargers featured by PremiumUSB have a few superficial options that can be changed according to customer preference. Take color options, for example. 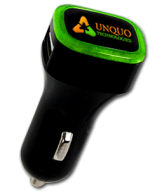 The USB car chargers are available not only in the standard black and white, but also in red, blue, green, and gray. All orders of the product come with free-full color printing of either a logo or a designed artwork on the product itself. There’s also an option to have the car chargers ready and packaged with each system. To get an exact price quote, feel free to visit the PremiumUSB website for more details. This entry was posted in USB Charger and tagged custom car charger, personalized car charger, usb car charger. Bookmark the permalink.